The past two quarters have delivered actual returns in excess of the targeted figures by as much a 3.84 percentage points. This significant outperformance helps exceed the targeted figures even as the quarters continue to mature and perhaps drop slightly as new data comes in. We haven’t seen a negative return in Estonia, Finland, or Spain since 2014. Additionally, all returns across all three countries have been double digit since 2015 giving investors a good place to grow wealth without the specific risk factors inherent to traditional equity investing. Spain and Finland have seen incredible, continued growth. Since 2014, both countries have consistently outperformed the previous year. In fact, Spain and Finland have each seen enormous growth in their actual returns in 2017 relative to 2016 jumping 14.52 percentage points and 7.09 percentage points respectively. While 2017 figures will probably change as we move to 2018, the improvement is likely to remain to a degree. Estonia has offered returns above the targeted figure across all loan ratings in Q4 of 2017 and Q1 of 2017. Even the higher loan ratings carrying lower returns are competitive with equity investments in a diversified index fund. 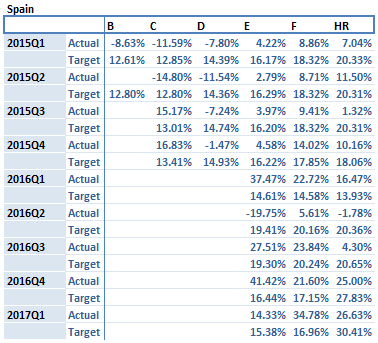 Over the last eight quarters only 8 performance periods of the 72 measured have failed to exceed their targeted figures. This means that 88% of the performance periods outperformed their goal. The riskier “F” rated loans have not dropped below an actual return of 22.40% for any of the last eight quarters. From Q3 of 2015 to Q4 of 2016, the “C” rated loans in Finland have consistently generated an increasing return growing from 7.20% in Q3 of 2015 to 18.58% in Q4 of 2016. The higher risk of “HR” rated loans have rewarded investors as seen by the fact that they have delivered the highest actual return of any loan rating for five of the last eight quarters. Spain offers fewer options for investors with only the “E,” “F” and “HR” loans available. However, the average actual return across all these ratings since Q1 of 2015 is 13.58%. Since Q1 of 2016, “E” and “F” rated loans have generated actual returns above expected returns more often than they’ve dropped below the targeted figure. 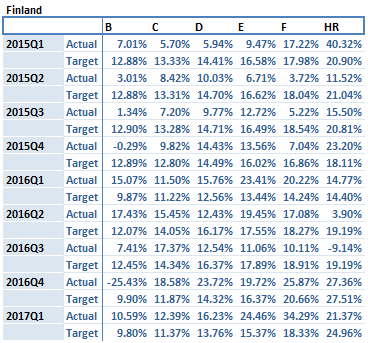 In the last three quarters actual returns have exceeded the targeted figure. 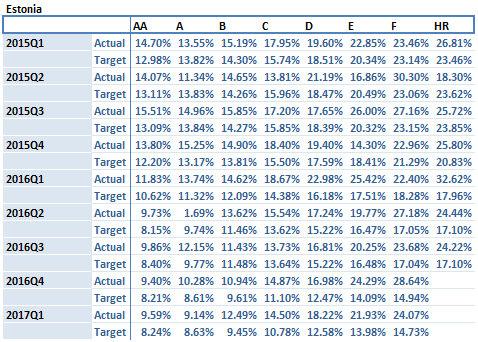 It’s important to note that this outperformance does not come as a result of diminished targeted goals. In fact, the targeted figure across all quarters since Q1 of 2015 has never fallen more than 1.97 percentage points. The total actual return across all countries has increased significantly since 2015 where it rose from 12.00% to 18.54% for 2017. Of course, there is still more data to come for 2017, however, even with a drop performance trends will be strong.